Even your most intense chocolate craving doesn’t stand a chance against those moist Flourless Chocolate Peanut Butter Cookies. Whip them in 5 minutes with only 6 ingredients and satisfy your next chocolate sweet cravings without guilt! A delicious clean eating recipe for the sweet tooth. 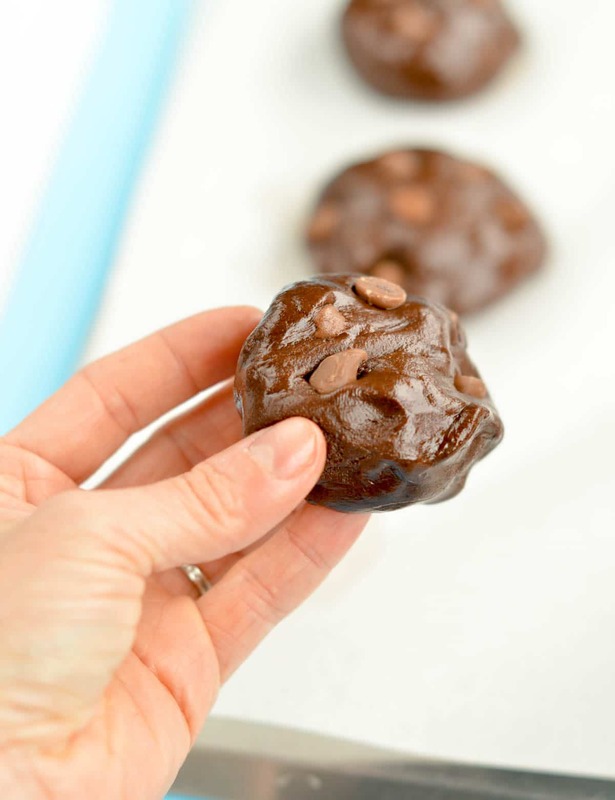 Flourless Chocolate Peanut Butter Cookies : no refined sugar ! Do you love peanut butter and chocolate? Heck! what a stupid question. Everyone loves that powerful combo, right? I am absolutely craving on chocolate lately – well I am 33 weeks pregnant now so it is quite normal. What is better than homemade food to satisfy your food cravings ? I don’t count calories but I love to know what is in my plate. At least if indulge too much I know I fuel up with natural food that is good for my baby and body. Peanut butter is great to use in baking and specially for cookies. It adds a lovely moist texture to cookies. But always make sure that you are using a fresh and runny peanut butter. Some brands tends to get hard and dry when the jar is opened for a while. It makes the ingredients difficult to combine even resulting in some lump in the dough. Nut butter are great ingredient to cut down on carbs and avoid flour in baking. Look at this cookie batter! Really hard to believe it is a flourless cookie, right? 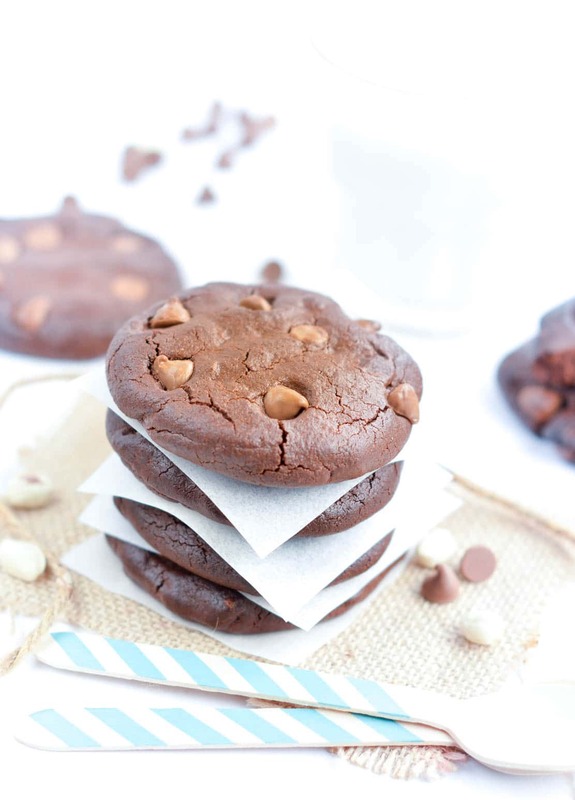 Those Flourless Chocolate Peanut Butter Cookies are also great as an after sport food. My husband ride to work 40 km almost 3 times a week. I know he is crazy ! But he said he love eating one of those cookie after work out. 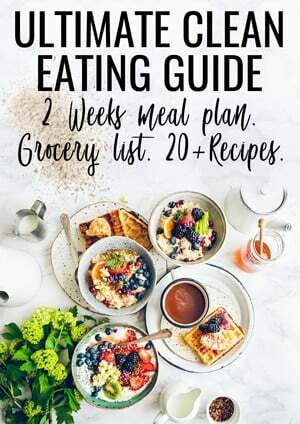 I used a tiny bit of honey in this recipe but you can also use any natural liquid sweetener of your choice like brown rice syrup or maple syrup. Sooo who’s making those Flourless Chocolate Peanut Butter Cookies for Christmas? It looks like an quick and easy cookie recipe to add to our Christmas cookie jar, right? 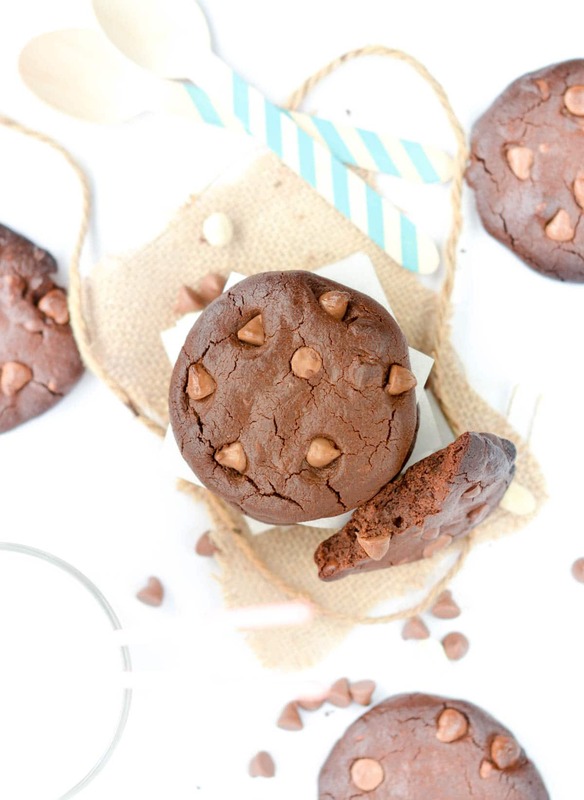 Flourless Chocolate Peanut Butter Cookies. 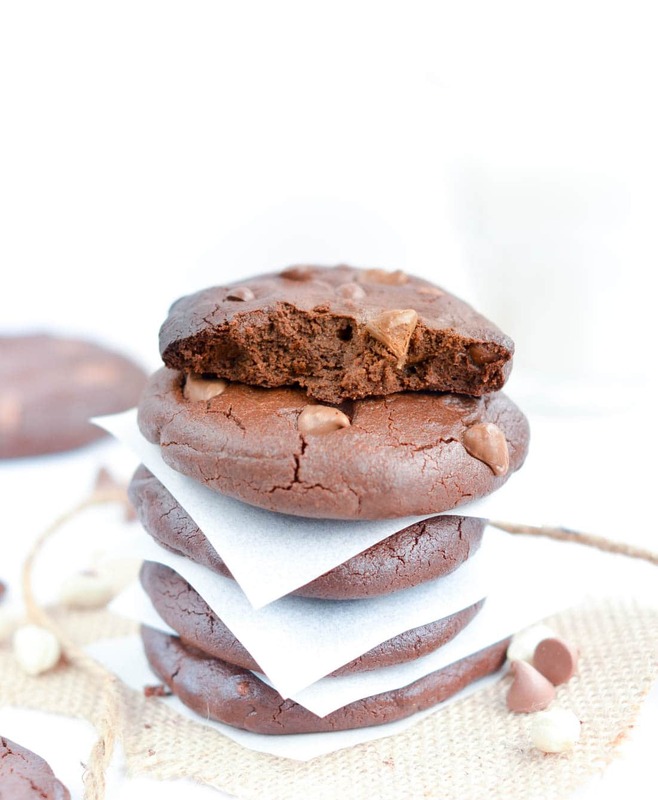 An Easy, flour less and gluten free moist chocolate cookies with no refined sugar. The best clean eating peanut butter cookies. Preheat oven to 356 F (180C). Prepare a cookie tray covered with a piece of parchment paper. Set aside. In a large mixing bowl whisk together the runny peanut butter, egg, sweetener- microwave 15-30 seconds if needed- and vanilla extract - if you add some. Whisk until all combine together. Add the cocoa powder, baking soda, chocolate chip and combine with a spatula until it forms a consistent shiny cookie dough ball. Shape 12 cookie balls with your hands. The dough is easy to shape like playdough. Place each cookie balls on the prepared cookie sheet. Press slightly with your hands to flatten the balls as a cookie. Bake for 10-12 minutes. The cookies should be soft and moist when removed from the oven. They will slightly get crispy on the border when cool down and the center will stay soft. Cool down on a cookie rack. Chocolate Chips: I used low carb chocolate chips but any chocolate chips will work well in this recipe. Storage: Store up to 2 weeks in a cookie jar at room temperature. Make it vegan : I made those cookies vegan using a flax egg instead of an egg. Stir 1 tablespoon of flax meal with 3 tablespoons of water. Sit for 15 mintues until thick. Use s an egg in this recipe. Swap honey for brown rice syrup. How do you think these would freeze? I am pretty sure it will freeze well. I never managed to freeze them because my family eat them so quickly that it never last more than 4 days in the cookie jar 🙂 Enjoy the cookies. Thanks for testig my recipes and see you soon around the blog ! xoxo Carine. These look so delicious, cannot wait to try them!! Do you know what the nutrition facts are in each cookie, by chance? YUM!! Hi Vanessa, the nutrition panel is now available just after the recipe box. Enjoy the yummy peanut butter cookies ! Carine. These look amazing and I can’t wait to try them! But before I devour the whole cookie jar like your family, I’d like to know if you have the nutrition facts for these. Thankyou so much! Thanks ! The nutrition panel is now available after the recipe card! Enjoy the cookies 🙂 Carine. For my taste buds I bet I could use a lot less sweetener. Would I need to replace the liquid if I use less honey? Hi Kim, I would recommend to use a low fructose liquid sweetener like brown rice syrup instead of honey or maple syrup. It has a very light sweet taste usually 30% less sweet in taste than honey. It means that you can use the 1/3 cup of liquid sweetener as recommended in the recipe but the sweetness will be 30 % lighter and it won’t change the texture of the cookies! You can buy brown rice syrup in any supermarket usually in the organic aisle or online on amazon here I hope this helps! Let me know how it goes! xoxo Carine. Such a delicious treat. Love of my peanut-butter redefined! Thank you a lot for the recipe. Thanks for your lovely feedback! I am so happy you enjoy those cookies! Peanut butter chocolate cookies are bombs 🙂 Enjoy the easy and healthy recipes on the blog my friend. Talk to you soon! xoxo Carine. Hi, Thank you SO much for your lovely comment! I am so happy when a simple recipe I share on this little blog makes others people happy. it is funny what you said about your husband because mine is the same! He has a super sweet tooth but he loved those cookies and didn’t notice it was refined sugar free 🙂 I hope you’ll find even more delicious recipe on the blog. Thanks for being around, reading me and testing my recipes. xoxo Carine. Do you think if I used a dry sweetener like swerve, it would still turn out edible? My hubby and I are on a low carb diet so I am trying to figure out how to make them so they are lower in carbs. Hi, I will not recommend it. The liquid sweetener really makes the cookies hold together. If you are looking for a low carb chocolate treat try my low carb fudgy chocolate brownie made with swerve! you’ll love it. Recipe is here. Enjoy the blog! xoxo Carine. could you use almond butter? Yes, sure any nut butter will work in this cookie recipe like cashew butter, almond butter. Hi Joann, I am sorry if you thought this cookie recipe was ‘very low carb’. 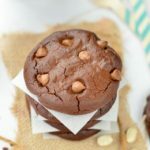 I never tag this cookie recipe as low carb so I am not sure what makes you think it was. Also, if you are following a very low carb diet you should know that any sweet recipe calling for sweetener like honey, maple syrup or brown rice syrup will never be extremely low carbs. This healthy peanut butter cookie recipe contains half carb of any regular store bought cookie and use only natural ingredient. I hope you enjoyed them anyway. Have a lovely day. XOXO. Carine. Can I use cocoa nibs in place of chocolate chips? Of course! It is a great healthy sugar free option. Enjoy the cookies. XOXO Carine.